There is a new Dyersburg area foreclosure that is a Freddie Mac foreclosure. This property is located at 136 Perry Drive in Dyersburg. There is a period of about 2 weeks where only owner occupants can bid on the property. Priced at $69,900 this property should sell pretty quickly. You can call the listing agent in Trenton or you can call me (731-589-7841). I can show it today! Here is a link to the property. Update: 6/23/15 I have this house under contract and hope to close the sale this week. There is a new Dyersburg area foreclosure located at 5365 Highway 78. 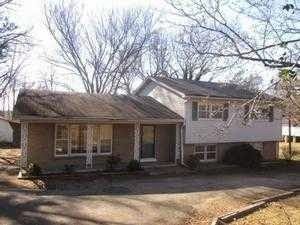 This is a 4 bedroom 2 bath split level home located about 3 miles from the ramp leading to Missouri. I sold this home to the last owners but they split up and let the house go. This is a Fannie Mae foreclosure and more details can be seen by clicking on the Fannie Mae button over on the right side. Update:05/04/15 This Dyersburg foreclosure is now sold and closed.